and set under the altar until Easter. To highlight the banning of the Alleluia, create (or get young or older artists to create) a beautiful poster of the word. Display it and highlight all the places you sing, say and pray “Alleluia!” in worship the week or two before Lent. Then, on the first Sunday of Lent display the poster at the beginning of the service before burying it. Burying it may mean putting it in a hole dug in the yard or it may mean putting it in a box and tucking the box somewhere in the sanctuary. Leave it there until Easter where young children can check that it is still there, but not get into it. 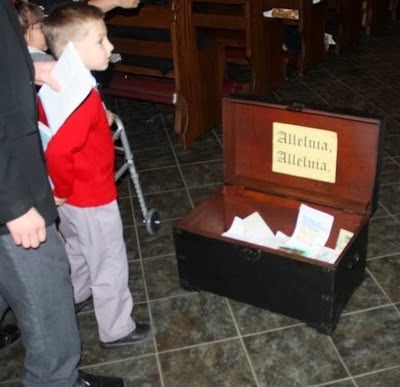 On Easter morning, bring it out and enjoy shouting and singing “Alleluia!” Some congregations have a fancy box that they use every year. Others make a new box each year, one that can be sealed tight at the beginning of Lent and is destroyed as it is opened on Easter. If you have pictures of yours, what about sharing them? Instead of hiding an “alleluia” poster for Lent, fold away a beautiful banner featuring the word “Alleluia.” Parade it around on a pole and sing lots of Alleluias on the Sundays just before Lent. Then, on the first Sunday of Lent, fold it away perhaps in a fine box that is stored in full view under the communion table. On Easter morning shake it out and parade it around with Alleluia songs. Also parade it around and display it prominently on each of the Sundays of Easter. Unless you have Pentecost banners, tie red ribbon streamers onto it for Pentecost Sunday.